Today is the day where many web sites are either blacking out or otherwise noting the danger that is SOPA (and PIPA), which I have spoken about before. 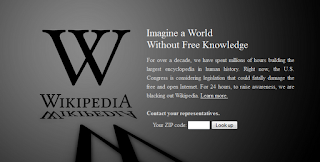 Wikipedia and Reddit are down, while sites like Amazon and Google have tags on their front page to inform people about the bill. If you are not sure of the details of these bills that are up for vote before congress, you can go to any of these sites; each presents their own unique take on the issue. It doesn't take more than a few minutes and it's worth it if you love the internets. In a nutshell: any web site can be shut down if there is any copyrighted material. This would include user-uploaded content, and the shutdown would occur with zero due process--it would just happen. And it would shut down the entire domain, not just the page or section with the offending content. While this could affect any web site, it is particularly hard against sites such as YouTube, Facebook, or even eBay which are dependent on the creativity of internet users. 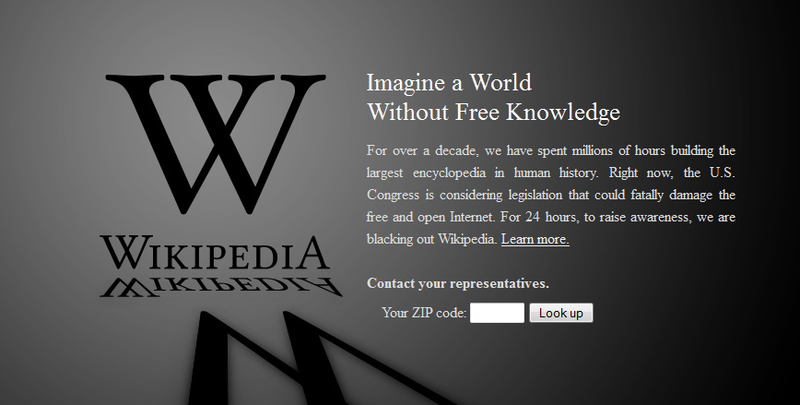 The White House has come out against SOPA, and while PIPA hasn't gotten as much attention, it's being targeted right now. So while it's doubtful that either bill will pass in its current form, there are still a lot of dangerous portions of the bill that need to be excised and addressed. The fear is that even though a lot of major politicians have backed off, there's still enough momentum that it may get passed in a different but still horrid form. I promise, this is the last post I'll make about SOPA unless it passes. This is my third post in a month about it. While I think it's important, I realize it's overkill. Take this time to do some research on an issue that most people probably find boring and esoteric but in reality will quite literally change the face of the internet as we know it.